as Leutnant der Reserve from Prussian Garde-Jäger Bataillon, detached to one of the infantry so-called battalions of the Palestine front, where he was killed in action 29 March 1918 at El Kafre, north of Jerusalem. Antonius's older brother Joseph (born 1886) had been killed in action in Italy in 1917 as a Lt dR in Garde-Schützen Bataillon. Anna and Mathilde (both nurses for the Order of Malta during the war), Karoline (a Red Cross sister in the war), Maria and the unfortunately named Cunigundis-- in convent school (I presume, being too young for nuns) at Kloster zum guten Hirten, and Elisabeth, Aloysius, and Agnes at home with their mother. NOW, there WAS another branch of the SAME prolifically Catholic family who went by ONLY Graf von Korff genannt Schmissing, PERIOD, so it is POSSIBLE that at family gatherings wherein a LOT of binoculars might have been left in the summerhouse, Hypen-Kirssenbrock might have helped. I've seen weirder chop jobs on paragraph long monikers. "Graf Anton" is rather more worrying, since I'd have expected "Anton Graf." (NOBODY would expect Antonius... child abuse, that). As far as awards, there is nobody (above to the contrary ) more "invisible" than a wartime Prussian Lt dR. But since I also have all 20 years of the Bund der Asienkämpfer magazines, I'll keep a lookout for any mention of his death in my periodic browsings of the articles, 1918-38. That Kriegsrangliste-Auszug is not Anton/Antonius, but Friedrich. The Vornamen are also wrong. Friedrich Graf von Korff gen. Schmising-Kerssenbrock was Friedrich Alfred Hermann Maria Hubertus, *10.4.1894 in Klanzig, gef. 3.9.1917 bei Muncelul, Rumänien. He was a Bavarian officer in the Infanterie-Leib-Regiment. 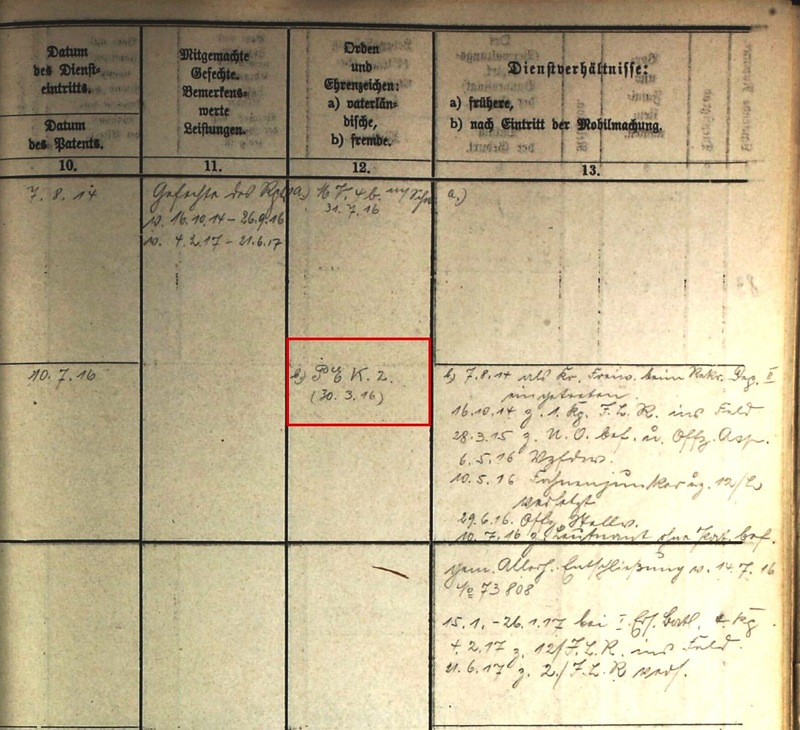 The Antonius whom Rick identified is the only Graf Korff gen. Schmising-Kerssenbrock with "Antonius" or "Anton" as a Rufname listed in the Gothaisches Genealogisches Handbuch der Gräflichen Häuser. Almost all of them also use the Latin versions of their names, by the way. His full name was Emanuel Maria Margareta Antonius Augustinus Thomas Bonifacius Fridericus Gabriel Bapt. Majella Hubertus Walpurgis Johannes Petrus u. Paulus Graf Korff gen. Schmising-Kerssenbrock, *30.6.1895 in Brincke. 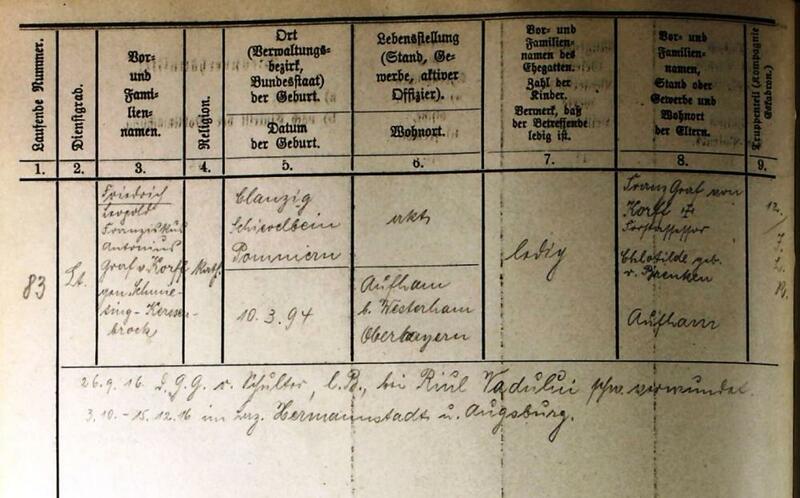 His brother Joseph was Emanuel Maria Joseph Walpurgis Klemens August Friedrich Leopold Dominikus Antonius Johannes Heinrich Rembert Hubertus Gerard Georg Ignatius Karl Graf Korff gen. Schmising-Kerssenbrock, *14.8.1886 in Brincke. Günther, the Fähnrich in the Garde-Jäger-Bataillon, was a second cousin (their grandfathers were brothers). The older brother Ferdinand referred to in the excerpt was an Oberleutnant in the Garde-Kürassier-Regiment, killed on 25.10.1918.